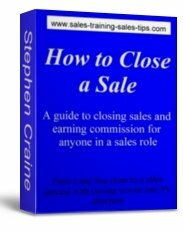 Sales closing technique developed from an old direct sales trick that was used to great effect for many products and services. This sales technique, that was popular in direct sales and one-off-sale hard closes, can be developed into a really effective way to close sales that you thought you had lost. It gives you a second chance to convert a sales prospect that has said no, into a buying customer. With a little thought and adaptation you can make it the right technique for your products and services. Whether you sell, to repeat business customers, or one off direct sales prospects, big ticket items or a service you provide, this closing technique will give you a way of increasing your sales from prospects you thought you had lost. I started my career in sales, like many other people, in direct sales selling anything from vacuum cleaners to home improvement products. One of the sales closing techniques, or tricks, I picked up was the call to the sales manager when I couldn’t close a sale. When a customer has said no, and you have tried everything to close the sale, you ask if you can phone your sales manager. You tell the customer that it is standard practice to phone your manager after every sales appointment. This was in the days before mobile phones. The manager then speaks to the sales prospect. They ask how you conducted yourself and what you said, what price you quoted, and why the prospect didn’t buy. Then the manager tries to close the sale again from a different angle. The sales person is new and got the pricing wrong. To thank the prospect for giving feedback. Or, there has been a cancellation and there is now an item available. I’ve heard sales managers criticising the sales person in an attempt to side with the prospect and create a reason to drop the price. The sales person plays their part by humbly admitting they have done whatever the manager accused them of doing. This creates a gap between the sales person and the prospect and this helps push the prospect closer to the sales manager. A relationship is built and the manager begins a new covert sales pitch. The sales closing technique worked well and many sales were closed with it. It was widely used in sales markets where you were trying to make a one off sale to a prospect you would never see again. The sales manager, or person playing the sales manager, could be pushy and use hard sell closing techniques, because they had nothing to lose and everything to gain. I phoned prospects for feedback and closed sales instead. It was while making phone calls to prospects that my sales team had met with but not managed to sell to, that I started closing sales. Because I was phoning for feedback and not trying to make a sale the prospects spoke openly and unguarded. They were honest about why they hadn’t bought from my sales team on the day of the sales appointments. This meant I had all the information I needed to close some of the sales. It worked so well we now actively take this action every month. Along with my top sales people we phone all the prospects the sales team have met with, but not sold to, and we use this sales closing technique. Prospects have since thought about the sales proposal and with some persuasion they agree to place an order. They may not have understood all the details first time around and starting a sales pitch again yields results. There are some questions that prospects now ask, and that’s a good way in to a new sales pitch. Those we don’t sell to are more willing to give us the real reasons why they will not buy than the sales person. We also get some really useful feedback on how we can help our sales people to develop. You can use these sales closing techniques with the help of just one other person. You don’t need a large sales team to make these proven sales techniques work. You don’t even need a sales manager. All it takes is another person to make the calls to the sales prospects that you don’t close. Depending upon your market, target prospects, and the products or services you sell, you can phone while the sales person is still there, or after they have left. Phoning the prospects while the sales person is still there, or just after they have left, is more appropriate for direct sales to the public or one off new customer sales. For a more professional approach leave a gap of a day or so before making the call. To make these sales closing techniques work you must prepare what you are going to say to the prospect. The call is just like any other sales pitch. You start with a brief introduction. Included in that sales introduction is the most important line of any sales pitch: The reason you are calling. Using motivators and agreement gaining you move on through information gathering and then a sales presentation of what you can do for the prospect. Then like all sales pitches you go for a close and deal with any sales objections. To build the sales stages of your call, and for all other sales pitches you want to create or improve, try the sales training workbook course I use with my sales teams. Show you how the stages of any sales pitch should be put together. Explain how to motivate a prospect to move with you through the stages and close the sale. Guide you through a step by step exercise program to build an effective sales process. 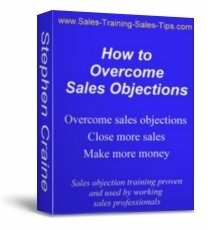 Give you a proven sales objection technique that will help you to close more sales. And, explain how you can use sales closing techniques from the start of your sale. With a full money back guarantee, all orders placed via the secure Pay Pal site, and a realistic price of only £24.50, you can click the button and start using it today. Click the Buy Now button to get your copy or for more information click the image or follow Selling Success Sales Training Workbook Course. Ask any questions about this page, or any aspect of sales and selling, on our Site Blog or on the Sales Skills questions page. You can add comments, ask questions, or even write a full page. Tell us about how you sell, your favourite techniques, and what you would like to know more about. Move from sales closing technique to the sales skills main page. Sales Training Sales Tips home page.